Illustration by Katie Kerpel. © Verywell, 2017. Missed period but negative pregnancy test? There are several reasons this may happen. You are pregnant, but the pregnancy hormones haven't built up enough. You are pregnant, but the test isn’t working. You are pregnant, but something is wrong. This can be an emotionally challenging experience. The good news is that most of the time, it'll be resolved in a few days. You'll either get your period, or you'll take another test and discover you are pregnant. Other times, it may turn out that something is wrong. But this is a rare situation. Let’s look at all the possibilities. A false negative pregnancy test is when the test comes up negative, but you are pregnant. The most common reason for a false negative is that you took the test too early. Another possible reason for a false negative is there isn’t enough hCG in your system. Pregnancy tests look for the pregnancy hormone hCG. This hormone increases as the pregnancy progresses. The range of normal for each day varies widely. It’s possible your levels aren’t high enough yet. A false negative can also happen due to test error. If you wait too long to read the results, you may get a false negative. (That said, false positives are more common with reading a test too late.) Make sure you follow the directions of your particular pregnancy test. Read the result in the time window recommended to avoid confusion. Another possible cause of a false negative is an expired test. Storing the test improperly (like in a wet bathroom cabinet) can also cause it to malfunction. A rare but strange cause for a false negative is being too far along in your pregnancy. For example, if your period is months late, a pregnancy test may come up negative. This is called the variant hook effect. The molecular structure of hCG changes over the pregnancy. At-home pregnancy tests are intended for early pregnancy. They may not react with later forms of hCG. Another rare but possible reason for a false negative is if you’re expecting triplets or even twins. This may be caused by what is known as the high dose hook effect. Ironically, unusually high levels of hCG can cause the test to give a false negative result. A very rare cause of a false negative is if the hCG hormone in your body doesn’t react with the anti-hCG chemicals in the pregnancy test. If this is the problem, you may need to wait a few more days before you can get a positive result. Or, you may need to have a blood test. In all of the above situations, a serum pregnancy test (via bloodwork) and an ultrasound may be needed to confirm pregnancy. An ectopic pregnancy is when the embryo implants somewhere besides the uterus. An ectopic pregnancy usually occurs in the fallopian tubes, but it can happen elsewhere in the body. An ectopic pregnancy doesn’t develop the way it should. The placenta formation is delayed, and this impedes the production of hCG. An ectopic pregnancy can be dangerous. If your period is late and you are experiencing severe pain, contact your doctor immediately. Ectopic pregnancies are rare—occurring in about 1 in 40 pregnancies—but they can be deadly. Of pregnancy-related deaths, 9 percent are due to ectopic pregnancy. Another rare but worrisome cause of false negatives is gestational trophoblastic disease. This is more commonly known as a molar pregnancy. Gestational trophoblastic disease (GTD) is a rare type of tumor that forms from a developing embryo. In less than 1 in 100 cases, a healthy baby can form in a molar pregnancy. Usually, GTD ends in miscarriage. GTD causes extremely high levels of hCG. As mentioned above, elevated levels of hCG can throw off an at-home pregnancy test and give a negative result. GTD is a tumor, but it’s rarely cancerous. Treatment involves having a D&C. If pregnancy hormone levels remain high, chemotherapy may be needed. The most common reason for a late period and a negative pregnancy test is that your period is simply off this month...and you’re not pregnant. If the stress or illness came just before ovulation, it could throw your entire cycle off. If you’re breastfeeding and your cycles have just restarted, you can expect your periods to be irregular for a while. This can make it difficult to know when your period is late. If you’re over 45, and your period is late, you may be entering menopause. But don’t assume you can’t be pregnant. Test anyway! Did you just stop birth control pills? Remember that birth control controls your cycles. You don’t know what your body’s natural cycle lengths are yet. It’s also not uncommon for the first few cycles to be slightly irregular. You can get pregnant in the very first month after stopping birth control. Don’t assume you can’t be pregnant. Test anyway. Another possible cause for an off-cycle is fertility treatment. If your cycles are typically short, fertility drugs like Clomid may extend your cycle length. If you just went through an IVF, IUI, or injectable cycle, this can also throw off your expected period date. Count 14 days from whatever your “ovulation day” was. If 14 days haven’t passed, your period isn’t late yet. What If You Haven't Had a Period for Months? Pregnancy isn't the only reason you may not get your cycles for an extended length of time. 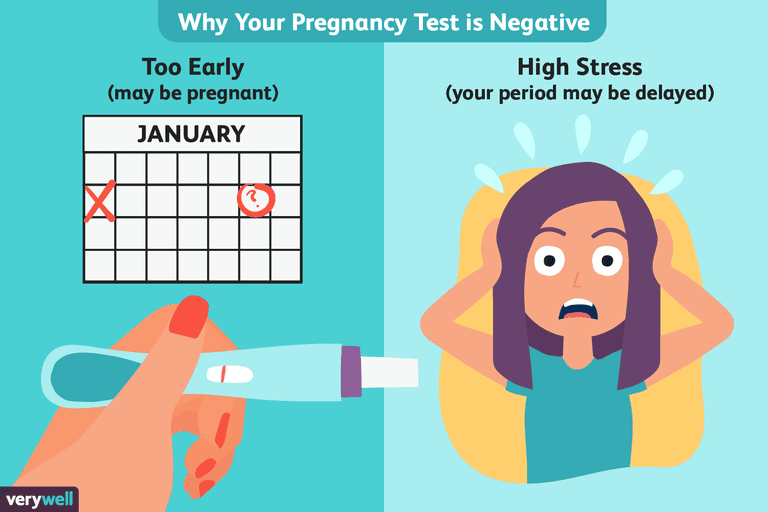 If your period is one to two weeks late, and you still are getting negative pregnancy tests, a visit to your gynecologist for a pregnancy blood test is recommended. If your periods are frequently irregular, talk to your doctor about when they’d like you to call. Most doctors will want to induce a period if you go more than two or three months without menstruating. Also, if your cycles used to be regular but become irregular, or your periods are irregular for more than three months after stopping birth control, you should see your doctor. Irregular cycles can be a risk factor for infertility. Get checked out. The sooner you get things evaluated, the sooner you can know what’s going on and receive proper treatment. These may be signs of an ectopic pregnancy. Ectopic pregnancy can lead to loss of your fallopian tubes, your fertility, and even death. It’s better to get checked out and find out all is fine. Don't ignore worrisome symptoms, and risk your life and health. D Yunus, H Muppala, F Hamer, F Clarke. “Three Consecutive False Negative Pregnancy Tests in a Twin Pregnancy: A Case Report.” The Internet Journal of Gynecology and Obstetrics. 2006 Volume 6 Number 2. Statistics on Ectopic Pregnancy. Florida Hospital.